You can also customize your trip completely! The different circuits through Morocco that offers Amazigh Morocco travel agency seek to offer the traveler a journey in which discover the most amazing and spectacular places in the country closely, unique and totally personalized. The aim of our tours through Morocco is to discover the heart of Morocco through an unforgettable journey. With all excursions from Marrakesh offered by Amazigh Marruecos Travel Agency, travelers can learn from ancient Berber villages of the Atlas to beautiful and emblematic cities like Rabat. The activities for each of these excursions, such as trekking, camel rides or hot air ballooning, become more attractive and give emotion to experience. Subscribe to know Marrakech differently and beautifully. Amazigh Marruecos Travel Agency offers you through our Sahara Desert tours the opportunity to meet this mythical place in an authentic and profound form with our native guides. All tours are designed to every different travelers, including 4 × 4 routes and dromedary. Go through our dunes and oasis in Zagora, Mhamid orMerzouga. We are the perfect choice for travelers who know what they wants. In Amazigh Morocco Travel Agency we have a series of trips that have a high demand from our customers. Among them you can find as many as a walk in the desert of Zagora, hiking to the waterfalls of Ouzoud and cultural visits to Marrakech. Ideal to know the most famous and significant of Morocco. 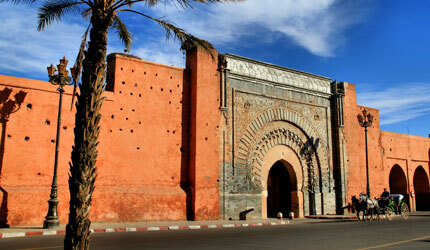 The tour of Morocco from Fez to Marrakech us about the places and the most emblematic architecture. The route of the 1000 Kasbahs take you deep into a world of oases, ancient fortresses and legends. Go with a route full of history and charm ridden. The circuit of Morocco along the Atlantic coast is full of unique landscapes, amazing cities and Berber villages. Undoubtedly, the most beautiful Atlantic coast. Marrakech is a city that you can not miss on your trip to Morocco. Its history, its colors, its corners … Everything is full of charm. Amazigh Marruecos Travel Agency is a project that seeks to highlight Morocco, its fantastic landscapes and its people. Since 2011 Amazigh Marruecos philosophy has provided alternatives for travelers who are not satisfied with canned Morocco trips and want to know it in depth. For traveling with the Amazigh people is important to know certain aspects of Berber culture and traditions. In addition, you should know some of its gastronomy, which diversity and richness are unique in the world. Delve into the Amazigh world to carry out one of the most exciting trips of your life. If you are thinking of traveling to Morocco you will probably want to read these tips and helpful facts about this fascinating country. Morocco offers the visitor a destination that combines outdoor activities, mountain, desert, coast, customs, ancestral tribes and cities steeped in history.